Strategic planning is one tool APQC offers to the education sector as part of its improvement initiatives. Many school districts are coming to APQC for guidance as they realize the value strategic plans can offer their students, staff, and community. Districts of all sizes benefit from this approach that helps them achieve goals to improve student outcomes as well as become a more efficient and effective organization. 1)Provides a focus. A strategic plan formalizes the school district’s mission, vision, values, goals, and objectives. This enables stakeholders to voice and agree on the same priorities and focus on the same path to improvement. 2)Engages the community and stakeholders. Part of the strategic planning process involves engaging the community and other stakeholders in feedback sessions. This insight early on helps the team develop a more targeted strategic plan and builds community support. 3)Helps create efficiency and saves money. School districts that implement strategic plans ultimately create efficiency that can translate to dollar savings. 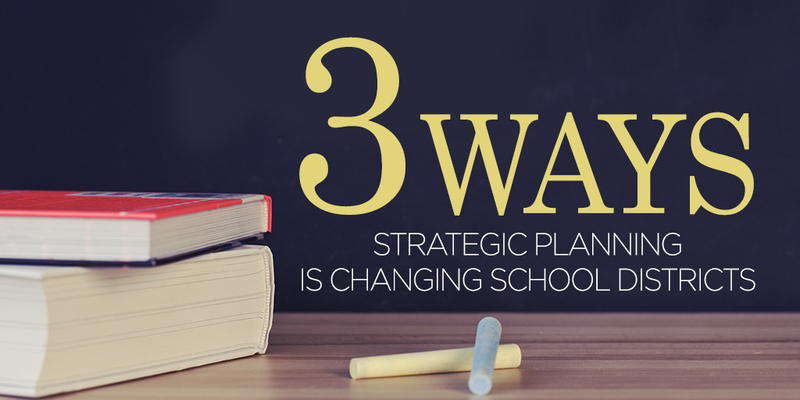 Most districts develop a three- to five-year plan that identifies the districts’ strategies, person responsible, timeline, and required funding. The plans should be reviewed regularly to monitor and communicate progress to stakeholders. School districts that implement strategic plans not only gain buy-in from internal and external stakeholders about the district work but also develop meaningful measures to track and gauge success. For more information about strategic planning in education, see How to Develop Strategic Plans in Education, in the APQC Knowledge Base.